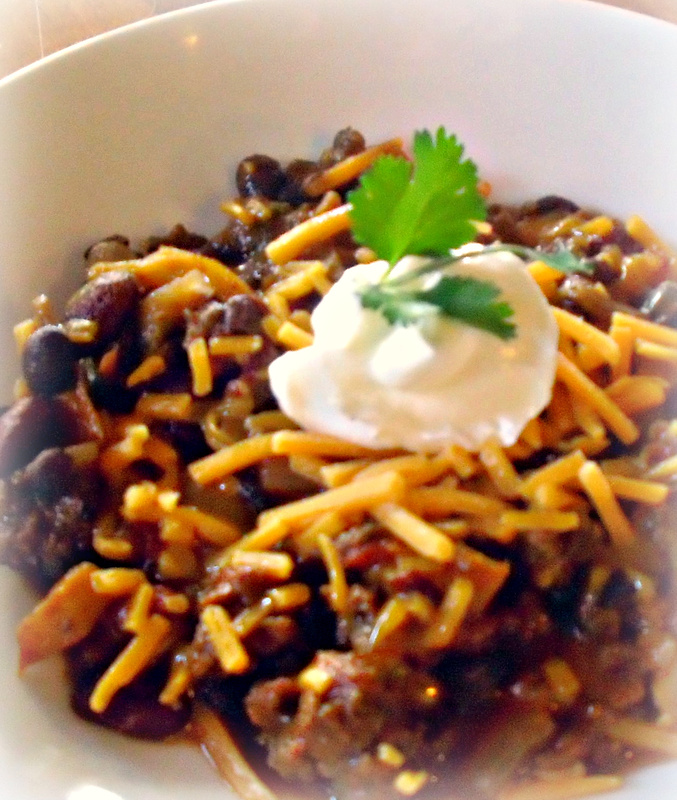 In my opinion, chili is the perfect food. It’s tasty, super satisfying, and really good for you. You get your protein, fiber (never underestimate the importance of fiber! )and veggies, all in one happy bowl. It freezes and reheats like a dream and you can dress it up with yummy toppings or eat it plain Jane. It’s, also, really easy to make. Once you get the basic process down, you can use your favorite combination of protein, beans and veggies to make it perfect for you. Start with 1 pound of ground beef, turkey or chicken in a dutch oven, large saucepan (make sure it has a heavy,sturdy bottom – hee hee, I know, I’m a child), or deep skillet. If your meat is extra lean, add 1 TB corn or olive oil. Add 2 TB chili powder, 1 tsp ground cumin, 1 tsp oregano flakes (you can sub 1/2 tsp ground oregano), 1/2 tsp red pepper flakes, a dash of cayenne pepper, a couple pinches of salt and black pepper. This is a good start – you can add more heat and salt later to your taste. Break up meat and cook til brown on med-high heat. I then drain the fat from the meat by putting it in to a strainer I have sitting in my sink. 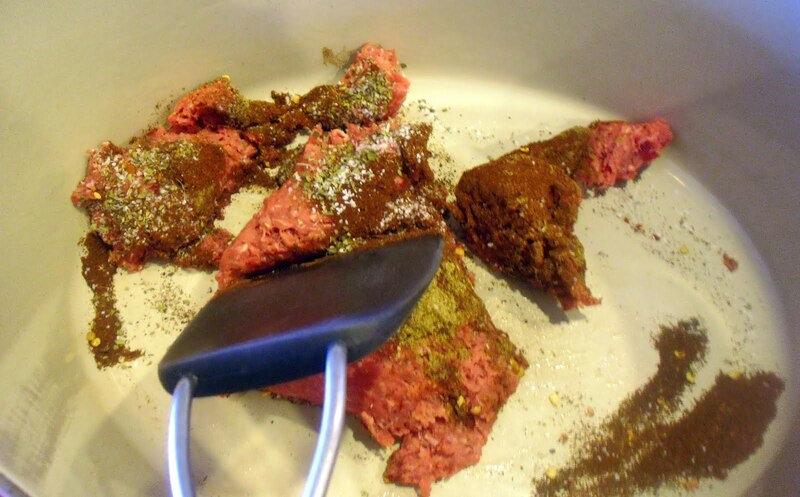 If you’re using super lean meat, simply put it in a bowl and set aside to add it back later. While the meat is browning, prep your veggies. 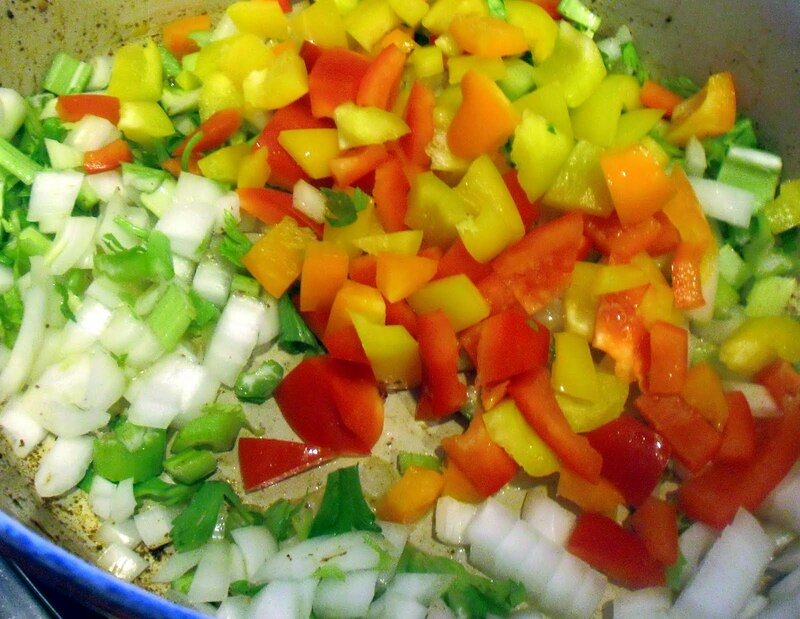 I chop one large onion (I always use sweet because they don’t make me cry), 1 cup chopped celery (go ahead and use the leaves, very flavorful), 1 & 1/2 cups diced red, orange and yellow bell pepper. 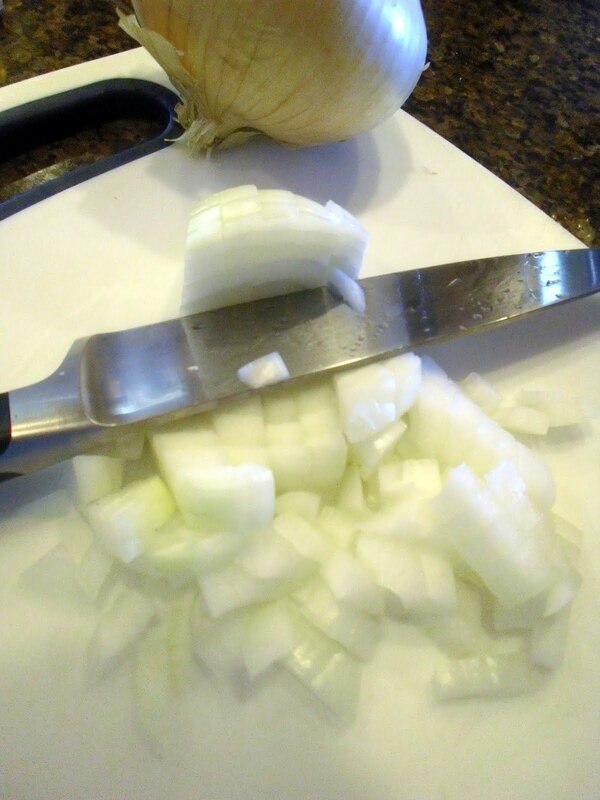 Put the veggies in the pan with 1 – 2 TB corn or olive oil and saute until the onions are translucent. If you are making meatless chili, add the spices at this time. 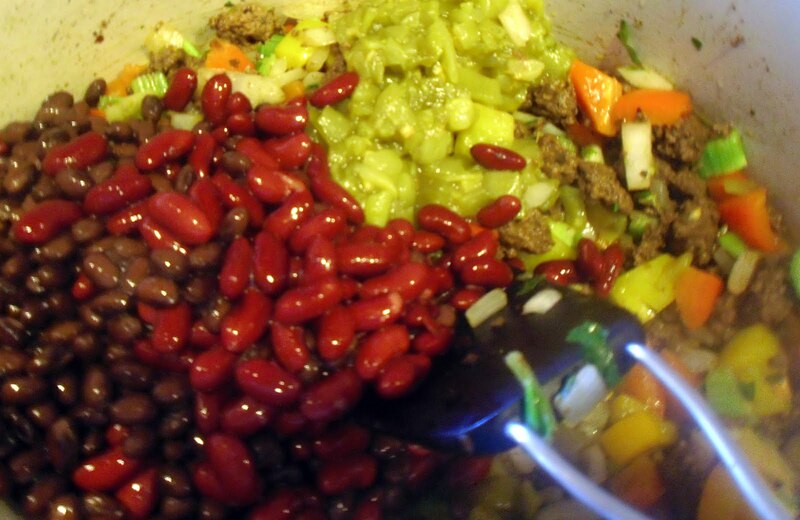 Add the meat back in with the veggies, then add 1 clove garlic, grated or chopped fine, 1 7oz can diced green chiles, 2 15oz cans beans, drained and rinsed, (I like to use both red kidney and black beans. Add an extra can if you’re making meatless chili), 1 15oz can diced tomatoes with the juice, 2 cups beef, chicken OR veggie stock/broth, and about 3 TB of tomato paste. 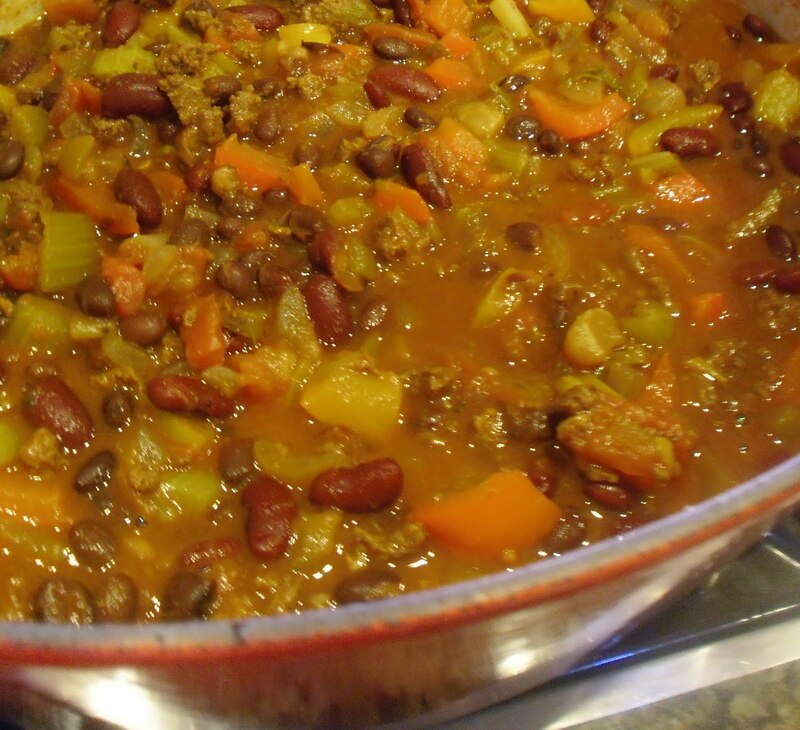 Allow chili to simmer for at least 20 minutes, stirring occasionally. Mine usually sits on the stove on low for a couple hours. Top with anything you want. I like sour cream or Greek yogurt, sharp grated cheddar and cilantro. Random quote I found. So hard, but it rings true since fear is the root of most bad behavior.